You have to follow the rules, even when those rules are unwritten social rules, and even when they inconvenience everyone involved. This is a true story that happened to me one Friday last fall. I go to four schools over the course of a week, so there are several schools I only taught at once a week. One week, my second Wednesday school principal (who was a sweet, grandmotherly type of woman) invited me to a barbecue the school was having that Friday. My Friday school was far away, but I told her I would try to make it, since it was possible to get there if I rode my scooter. She told me to get there by 3pm and since my classes at the other school finished at 2:30, that was perfect. I rode my scooter along back roads in the mountains and got to the school just before three. They were packing everything up. Here was my first dilemma. I could have just taken off, but I didn’t want the principal to think I hadn’t come. That might make her feel bad. So I went through the crowds and found her to say hello. I was planning to just say hi and leave but of course, as a good host who had invited me there, she couldn’t let that happen. 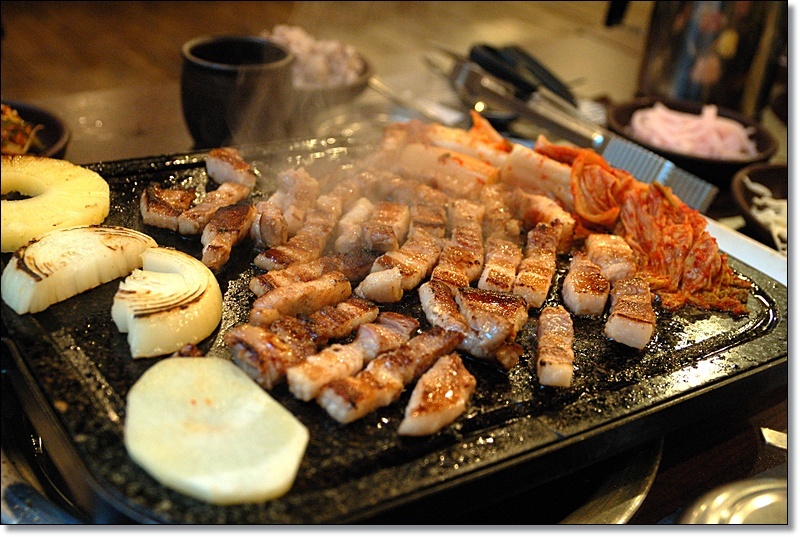 So she told some of the women to get out a grill and cook up some meat for me (samgyeopsal, for those who know Korean food). I tried to refuse, but like all grandmotherly-type women, she didn’t know the meaning of the word “no”. I could have just left, but that would have been rude. So there I was, sitting at a table while a woman cooked meat for just me, while most other people were sitting around talking or cleaning up. The principal, because she was hospitable, sat next to me to keep me company. She didn’t eat anything, since they had all eaten before. However, she did make up food for other people. 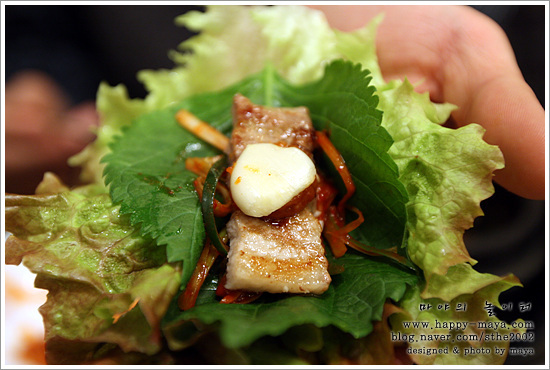 In Korea, when you eat barbecued meat, you take a lettuce leaf, then put a piece of meat on it, with whatever other vegetables or sauces you want, then wrap it up like a little package and eat it in one bite. The principal kept making these up for other people, who had to take them even though they were full, since you can’t say no to the principal. After a while, most everyone else wandered off to deal with other stuff and a few women sat talking, while I kept eating. They had made a ton of meat and while it was delicious, I was getting full and felt uncomfortable sitting by myself. I kept asking others to come eat with me, but they all said they were full. I apologized to the women cooking, since they were only waiting there for me to finish. Of course, they said it was fine, since it was have been rude to say anything else. I hope it really was fine. They had made a lot of meat and I felt obligated to eat it all or at least make a big dent in it. I didn’t eat it all and finally left, very full. I don’t regret going, since it really was delicious meat, but thinking back it is amazing to see how the iron rails of social etiquette predestined this scenario. It could not have played out any other way without offending someone or at least breaking unwritten rules. Every culture has its own social etiquette rules, some more strict than others, but they’re there so that everything runs smoothly. Whether you like it or not, you have to follow the rules. …Or do you? What do you think? Are there some social etiquette rules you break?